I got the idea to make these from a great little restaurant in Eagle Rock, called Fatty's Cafe. Their potato tacos were to die for and I just had to try and make my own version. I included all the same ingredients that was served in theirs, except that I seasoned my black beans according to a Viva Vegan recipe. These tacos did take awhile to make, so I would save it for special occasions only. They are very versatile and can work great as a little appetizer or as main dish. 1. Rinse and scrub the potatoes really well until no more dirt remains on its skin. 2. Pierce the potatoes several times with a fork, wrap in foil, and place on a baking sheet. Bake for 35 minutes, until they are soft enough to be easily pierced with a knife. 3. Meanwhile, start preparing the beans. In a large non-stick skillet over medium heat, combine the olive oil and garlic. Allow the garlic to sizzle for 30 seconds, stirring occasionally. Add the onion and fry until the onion is translucent, about 5 minutes. Add the chipotles and their sauce and the vegetable broth, stir and simmer for 1 minute. Add the black beans, bring the mixture to a simmer, and cook until most of the liquid is absorbed but beans are still moist, about 4 minutes. Turn off the heat and allow beans to cool. 4. When your potatoes are finished baking, remove them from the oven, unwrap, slice the potatoes in half lengthwise, and let cool. 6. You can either start loading the potatoes now or return them to the oven for a slightly crispier texture. To bake again, spray a little olive oil on the outer skin of the potatoes. Return them back to the oven, skin side up, at 375 F for 20 to 25 minutes, or until the skin is at your desired level of crispy-ness. 7. 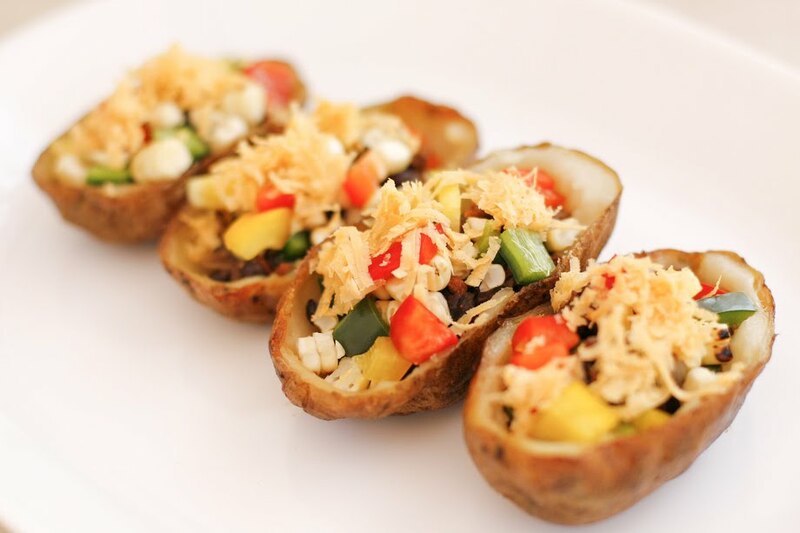 To serve the potato tacos, spoon a little of each filling into the potato ( black beans, corn, bell pepper and pasilla pepper ) and top with vegan cheddar cheese. Optional - Top each potato taco with your favorite salsa. Ooh, Jacklyn, my Cauldron Boy would love these. Two of his favorite foods together. Baked potatoes and tex mex style stuff-yum! By the way, I love the way you take your photos. The way your camera zooms in on one part/thing and the rest is kind of unfocused. Neat! And thank you, its the lens I use. I like that effect too! never tried vegan cheese. but your blog makes me want to try! Boil the water and add quinoa. Lower heat to medium low and cover for 15-20 min. When quinoa has cooled add chopped veggies and spices, serve chilled. Toshiko, if you ever try it, get Daiya cheese. It's the only brand that best resembles dairy cheese. Ooo Frosty Duncan! The recipe sounds very good! I will try this next time I make quinoa. Thank you for sharing!